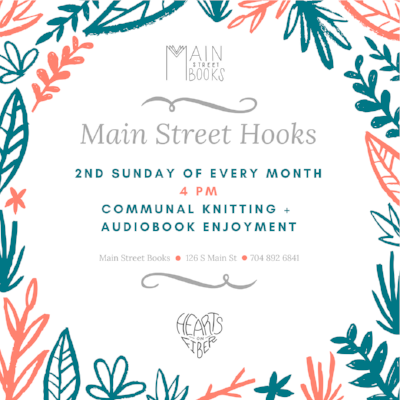 Main Street Hooks is a free and open book and knitting club brought to readers by Main Street Books in partnership with Davidson's forthcoming craft store Hearts on Fiber that meets at the bookstore monthly for an hour of communal knitting and audiobook enjoyment. Hearts on Fiber staff are available at every meeting to guide beginner knitters/crocheters, while intermediate to advanced fiber crafters continue their own projects in the cozy company of fellow yarn enthusiasts and book nerds. Bookseller and knitting extraordinaire Jan Blodgett is also on site to assist with advanced knitting snafus. Hearts on Fiber also offers an on-site pop-up shop during Main Street Hooks meetings to meet the supply needs of club members.